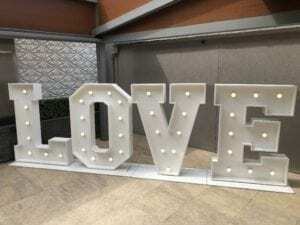 I decided to add Giant letters as an optional extra with my wedding discos. I saw them at lots of weddings where I provided the disco but always wanted to switch them off once the disco started as they were overpoweringly bright! I went hunting around the internet to find something that I thought was better. I decided to buy LED “ LOVE” and “Mr & Mrs” to my hire stock. The ones I opted for are battery powered too so no cables to trip over, and the LED’s light up the letter but not the whole room! The function manageress at The Dalmeny Park Hotel said they were the best she’d ever seen! Heres a photo of them at Dalmeny Park Hotel. They are extremely well made and stable and because they are battery powered present no risk to inquisitive children’s fingers. They are very unlikely to be damaged if accidentally knocked over too. I also bought a set of “Mr & Mrs” letters which do take up a fair amount of space. In the photo below which was taken at Crossgates British Legion Club near Dunfermline I put them in front of the disco. 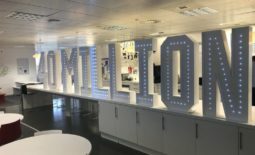 I had my reservations about doing this as I didn’t want the LED dance floor, which I’d also supplied, overpowered by the lights in the giant letters. I’m very pleased to say that the effect was absolutely perfect and I left the giant Mr & Mrs letters on all night! 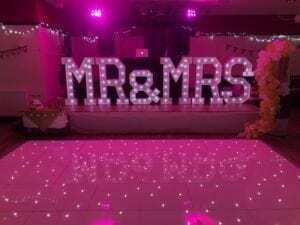 White LED dance floor and giant Mr & Mrs. I offer an amazing package deal of a 16ft by 16ft white LED dance floor plus either a photo booth or a magic mirror and my amazing wireless mood lights and disco for £1000! You can add either 4ft tall Mr & Mrs or Love letters to that for just £100! 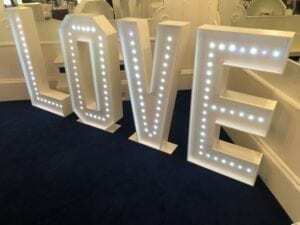 I also provide 5 ft tall “LOVE” letters which are really really big but great for photos! My latest addition is my heart arch which is 7ft tall and makes a great centrepiece especially when you put your wedding cake underneath. It’s superb for photos! I offer lots of different packages to suit most budgets. Another advantage is that dealing with one supplier means less logistical problems and less people for you to have to liaise with. I also offer “Prom” your initials, numbers for 21st, 40th, 50th etc. Just let me know what your require. 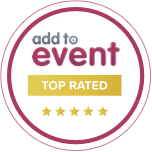 I cover the whole of Scotland and Northern England and offer an exceptionally high quality service and I’m always available to discuss your event with you. My photo booth hire at a wedding in Inverness. Wedding at Bearnock Lodge Near Urquhart.